Our award winning EnergyCAP software is the foundation of a comprehensive utility bill accounting & energy management solution. 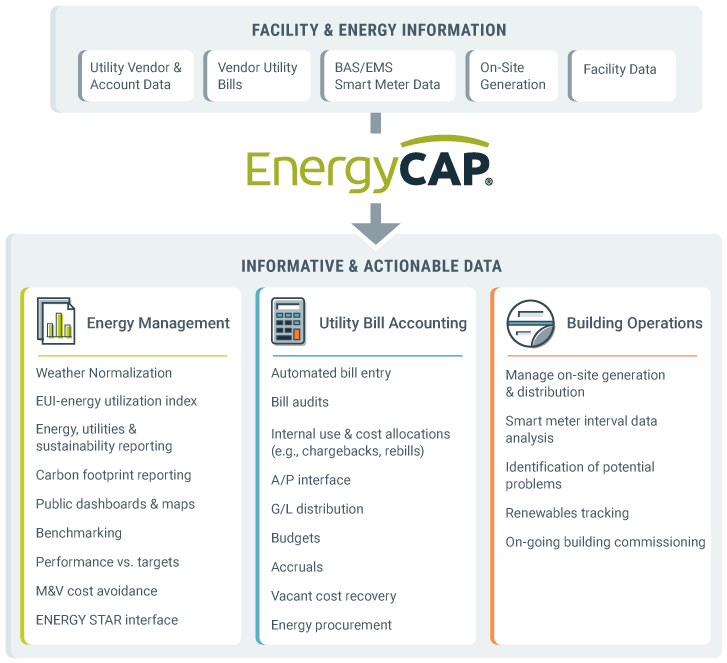 Serving as the hub for your vendor, utility, and facility data, EnergyCAP’s powerful analysis and reporting functions deliver value across energy management, sustainability, accounting, and building operations. EnergyCAP is the only tool that energy and sustainability managers need to identify inefficient facilities, evaluate the impact of energy conservation projects, obtain ENERGY STAR® ratings, track emissions, and communicate it all through live energy dashboards and a library of more than 300 reports. Streamline your utility bill workflow with EnergyCAP and say goodbye to manual data entry, complex spreadsheets, late fees, and other inefficient processes. You will work smarter and save more through reduced labor costs, automated bill entry & auditing, simplified internal use & cost allocations, improved budgeting, and more. EnergyCAP’s value extends beyond accounting, energy management, and sustainability. Facility managers also benefit from access to comprehensive, detailed, and timely energy data through an easy-to-use, informative interface.